RAMPS sourcing complete. The last step is to put everything together. In the picture you see my bare RAMPS board, the pick sheet I made with all the components attached, and the soldermask I hand cut out of 0.15mm thick mylar sheet. 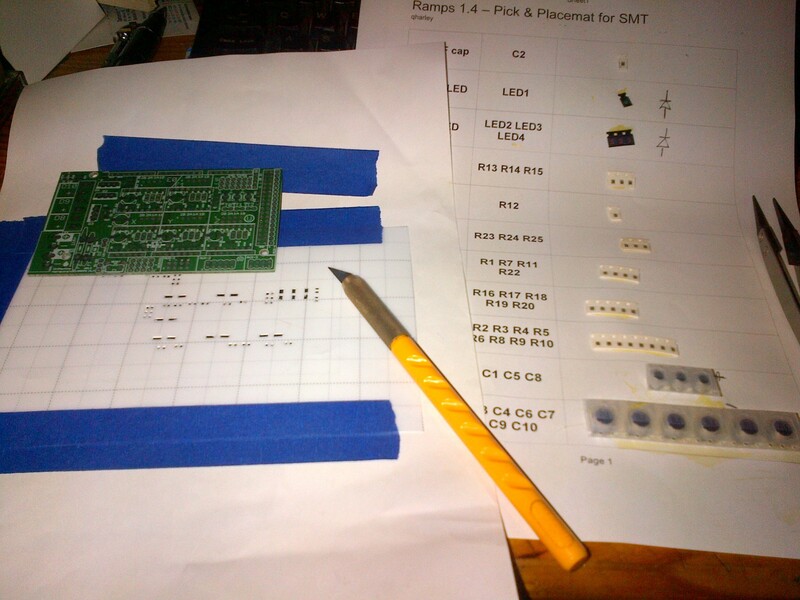 RAMPS 1.4 uses larger SMT components, so hand cutting the solder mask to an acceptable tolerance is not hard. I have contacted a local laser cutting service to potentially make the mask for the stepstick though. It is just too fine, especially around the IC. The previous time I tried to build RAMPS I was way too eager, and used a syringe to apply the solder paste. The effect was that the components lifted and drifted on the large blobs of solder, causing problems in the denser areas. I also did not have the right 100uF caps, causing the headers for the pololu / stepstick drivers headers not to fit.